Striking the balance between code compliance and energy-efficient ventilation is possible with new technology from Aprilaire. Patented control logic was created specifically to meet the challenges faced by today's home builders. 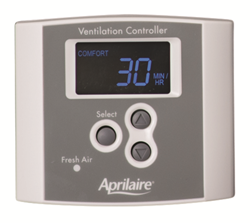 Ventilation logic from Aprilaire features temperature and humidity lockouts for more efficient, code-compliant fresh air delivery. “Tighter, well-insulated building envelopes and increased ventilation requirements have changed the health and comfort equation in new home construction." Energy efficiency and code compliances are front and center in new home construction, yet they often run counter to one another in the real world. While builders bring in fresh air to ensure health and comfort and meet new code requirements, their homes are intentionally constructed with a tight envelope to reduce passive air exchange and preserve energy goals. Aprilaire engineers anticipated that the convergence of energy efficiency and requirements for fresh air would require unique solutions – and set to work developing products and controls that could satisfy this unique application. The result is a patented control logic that sets Aprilaire fresh air solutions ahead of the curve. Aprilaire has a strong tradition of developing HVAC solutions that improve conditions throughout the home. The company’s solutions have continued to adapt to changing trends and requirements for heating, cooling, and air quality. Working alongside home builders, raters, and contractors Aprilaire senior engineer for ventilation Scott Grefsheim set out to design a better solution. Grefsheim’s work led to a new U.S. patent: System and method for adjusting fractional on-time and cycle time to compensate for weather extremes and meet ventilation requirements. This logic is now used in all Aprilaire ventilation products and the 8120X control. The Model 8120X Fresh Air Controller optimizes when and how long to ventilate the home based on weather conditions and the indoor relative humidity. This allows homebuilders to satisfy ventilation code requirements and provide the most energy efficient operation by ventilating without introducing overly hot and humid or cold and dry air to the home. Ventilation without this logic increases the burden on HVAC systems and negatively impacts energy efficiency. Aprilaire is the number one trusted brand in the indoor air quality industry for more than 60 years. As a division of Research Products Corporation, the company designs and manufactures whole-home indoor air quality products – partnering with HVAC contractors, distributors and home builders to provide comfort, health, energy efficiency, and preservation of the home.